What is it about luxury candles that are so appealing? Is it the exotic fragrances? The precious packaging? The alluring websites? Perhaps it is all that and more. Enter D.L. & Company. This is one luxury candle company that has been on my radar for quite some time. Their fragrance and candle line have been calling my name since…well, since forever! The D.L. & Co. website is absolutely stunning. Soft, gentle music plays while allowing you to browse all their products in style and comfort. The dark and muted colors present an air of elegance. After being lost in it all for a moment, I was able to hone in on my primary quest ”“ the candles. And what a beautiful array they have! Since my pocketbook was overriding my heart, I narrowed my selection to a single candle ”“ a 10-oz candle in the scent Hemlock from their Signature Collection. What did my Hemlock candle look like? The packaging for this candle is perfect for gift-giving. The black Burmese silk hat-box had the company logo prominently displayed along with scent name in a classy, scripted font. The box was tied with a black French satin ribbon, enhancing the presentation. Opening the lid was like opening a Christmas present. The candle itself was further wrapped by black tissue paper (imported from Switzerland) with a gold seal. I took my time unwrapping so I could soak it all in. This is the type of box that is worth preserving and using later to store trinkets and such. 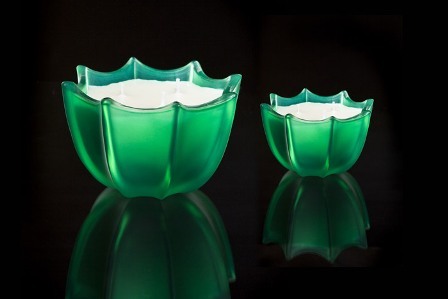 The candle itself is a heavy, green frosted jar made from Australian sand with a beautiful scalloped pattern. The deep green hue intensified as it went from top to the base, making for a unique and mesmerizing container. Doug Little (D.L.) designs these vessels and only a limited number of each is created at a time. This makes it not only beautiful but also a clever conversation piece. Tilt the bowl and view the artist’s initials…a true work of art that is also worth saving once the wax is gone. The wax was off-white and it held three well-centered, all cotton wicks. The wax is a mix of palm, maple and soy waxes. What did my Hemlock candle smell like? Sounds heavenly! A quick cold sniff did not reveal much. I smelled a bit of a “green” type of scent but nothing very distinctive. All the magic happened once the candle was lit. I started this candle in a larger room than I normally start most candles. It was a-ok because this candle was definitely up to the challenge and then some! It filled the room with a soft, earthy type scent. I was afraid the pine or cedar might overwhelm, but they did not. They blended nicely with the other scents to make this an earthy type scent that was moderately strong. The scent tended to linger after the flames were extinguished… a really nice bonus! How did my Hemlock candle from D.L. & Co. burn? The candle burned evenly and it did not take long to reach a full wax pool. I’m sure the three wicks and unique wax formulation helped in that regard. 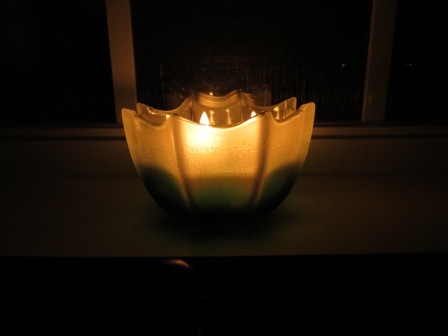 I was able to burn this candle all the way down with no wasted wax… a huge plus for me! This was a very clean burning candle with no sooty mess of note. My only complaint in this area had to do with the wick size… they were quite thin and at first glance did not appear up to the task. But I must say that initial impression quickly faded away as the candle performance did not seem to suffer. As is customary for me, I have high expectations for luxury candles. Why plunk down the cash with little to no reward? D.L. & Co. did not disappoint. Everything… shopping experience, presentation, product performance… everything lived up to expectations. Would I have liked it stronger? Sure! After all, the scent’s the thing. That being said, I did think the scent throw for this candle was pretty good and one I didn’t have to be right next to in order to smell. It filled a moderately sized room with a pleasant, unique aroma from start to finish. And to see it burning? Ooooh that was a thing of beauty. Candle perfection! These candles can be bought either directly from their website or you can often find a better price if you shop around online. Pick one up yourself and be prepared for sheer luxury.Happy Candle Burning! Have you tried Hemlock from D.L. & Co? Review it with us. In the comment section below, review and star rate your experience… it’s easy!